The more attentive of you may have noticed I haven’t updated this site for some time. I am still intending to finish trawling through the various plans for Saving Africa that are out there, as well as the many criticisms of those plans. But life keeps getting in the way. If you think you’d like to help out, I’d love to hear from you. You could summarise a book or research a topic. No specialist knowledge needed – that’s the point! Email me at africa @ brasstacks.org.uk if you can lend a hand. Or just sit tight – I’ll get back to it soon, I promise. We’ve reviewed the proposals of the UN Millennium Project, the top-level think-tank set up by Jeffrey Sachs and Kofi Annan to recommend ways for the world to meet the Millennium Development Goals. Like Sachs’ personal plan for ending poverty by 2025, it’s a considerable shopping-list of investments and reforms to be heavily supported by rich-country aid. So let’s get down to the nitty-gritty and see how much it will all cost – and why the Project believe it’s worth it. You can click for a larger view. As you can see, education and health are the main investment priorities, closely followed by energy and transport infrastructure. In terms of funding, the level of aid required (bottom row) increases consistently up to 2015. Note, however, that the level of funding from Ghanaian households and the government also increases. In fact, the report estimates governments will be able to spend 4% more of GDP – that’s a considerable increase in government budgets – on investments to meet the goals by 2015. This would be met by new taxes and re-directing current low-priority spending. So this isn’t a free lunch. What do these calculations translate into at global level? 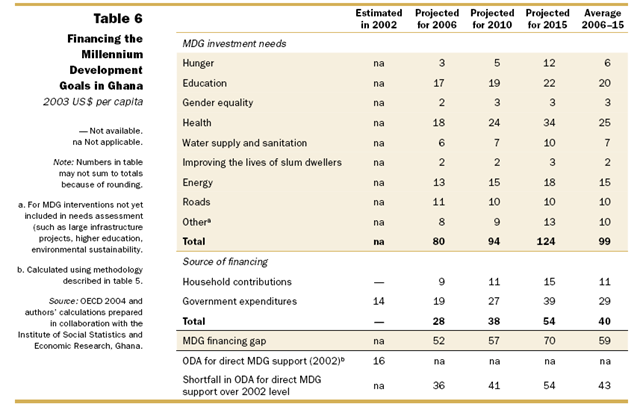 The report – which was published in early 2005 – estimates that financing every low-income country to meet the MDG’s would cost $73 billion in 2006, with annual spending rising to $135 billion by 2015. However, there are a host of other costs: $10 billion to support middle-income countries like Brazil and India, spending on staffing and running aid agencies, debt relief, etc. In total, the cost of meeting the MDG’s everywhere is for $121 billion in 2006, with annual payments rising to $189 billion in 2015. The table below shows the costs laid out. So that’s the amount of aid needed, right? Well, not quite. 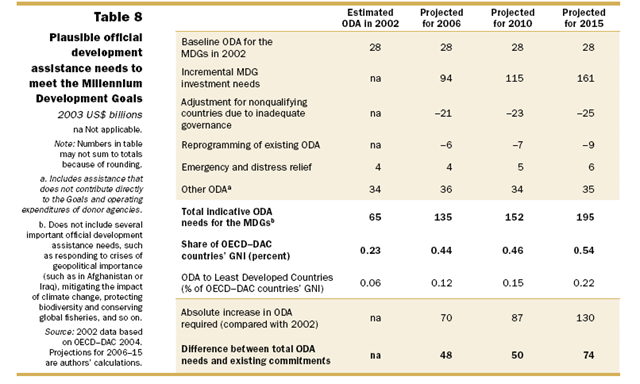 Some existing aid can be “reprogrammed” to meet the MDG’s, which takes a bit off the figure; but equally, some existing aid needs to be maintained that isn’t strictly goal-related. What’s more, to help all low-income countries to meet the goals won’t be possible; governments that don’t show the necessary planning, and commitment to democracy and human rights, won’t be eligible for help. So what does this work out as, in real money? Well, it’s between 0.44 and 0.54% of rich countries’ GNP. So this is still short of the 0.7% of GNP we’ve been promising for aid for around thirty years. To put it another way, it’s around double the current level of aid. This roughly chimes with the report of the Commission for Africa, who proposed providing another £25 billion (around $50 billion) of extra aid now and more after 2010. Of course, this doesn’t mean donors don’t have to reach 0.7%. The table above doesn’t include many things currently receiving major aid, such as spending in countries of geopolitical importance, like Afghanistan and Iraq. 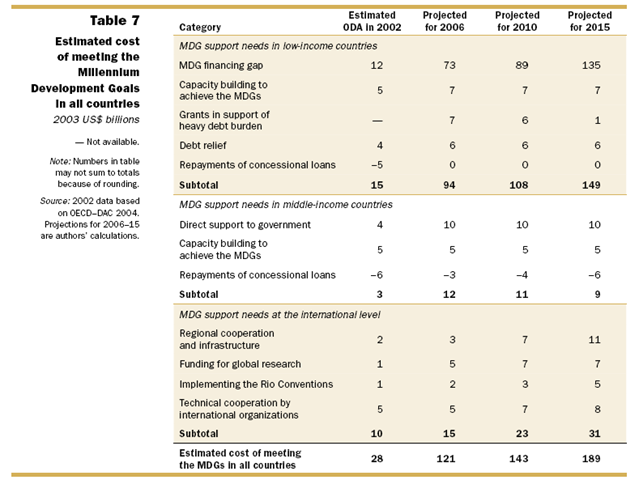 To accommodate that spending on top of the MDG spending would probably need aid of 0.7% rich-country GDP by 2015. Since the 0.7% target was agreed in 1970, it has been reaffirmed several times, most recently in 2003. But so far, only five countries –Denmark, Luxembourg, Netherlands, Norway and Sweden – have reached the target. Several other countries, including Britain, have timetables to meet it by 2015. But the US, which because of its vast economy would account for almost half of the total extra aid needed, is currently at less than 0.2%. The report endorses Gordon Brown’s plan for an International Finance Facility to front-load aid by issuing bonds based on donor commitments. In other words, bonds are sold on the market that give the buyer the right to receive future aid, and the money raised can be given right away to poor countries. So that brings to an end our long trawl through the poverty proposals of Jeffrey Sachs and the UN Millennium Project. I’ll prepare a quick one-post summary of the key points for reference. Then, we’ll look at some of the critics of Sachs’ proposals, and what it is they dislike. Page numbers come from the Overview Report. You can also see the full 300+ page version, ten key recommendations, or the reports of the individual task forces. Oh dear. Indeed, for all the celebrations that met 2005’s historic aid pledges by the G8 at Gleneagles, Scotland, the truth is that a serious bid to meet the goals has not yet begun. The extra aid promised has yet to materialise. It seems likely, therefore, that the MDG’s won’t be met everywhere by the agreed deadline, 2015. And yet, the goals remain the most comprehensive and internationally supported development framework ever agreed (though they certainly have their critics). So even if 2015 is unachievable, aiming for 2017 seems better than giving up. So let’s pretend that, a little behind schedule, the world is now eager and ready to fund and support the UNMP’s recommendations. Where do we start? Every developing country that wants to be eligible for support should prepare an MDG-focussed poverty reduction strategy, a plan to achieve the goals complete with precise costings and measurements of the aid required. Fast-track countries, that are most suitable to receive support, should be identified (more on this below). International agencies should immediately begin working with poor countries to train thousands of teachers, doctors, planning professionals, engineers, and “village specialists” in health, agriculture, forestry, road maintenance and other basic skills. This is to ensure that once infrastructure projects such as new schools and hospitals begin, they aren’t messed up by lack of staff, as has often been the case in the past. The “quick wins“, cheap interventions proven to be effective, should be implemented in all as widely as possible. It would take just two years, the report argues, to distribute anti-malaria bed nets to all at-risk African children. But for many rich-country observers, point 2 is the key obstacle. With so many poor countries, with widely varying standards of government, and different needs, how can we identify those best suited to receive extensive support straight away? The poverty reduction strategy process itself. Although a true process for assessing MDG-focussed poverty plans is yet to be put in place, countries’ existing PRSP’s are assessed by the World Bank and IMF, and several have recently been praised for their quality and comprehensiveness. So, by identifying these countries and getting immediately started with investment and training, and by encouraging poor countries to prepare detailed plans for meeting the MDG’s, it’s still possible, the report argues, to get the process off to a flying start. Finally, next time, we’ll remind ourselves of the argument for taking the steps necessary to meet the goals. The ONE campaign, the modern US incarnation of the Make Poverty History / Global Call to Action on Poverty campaign of 2005, has put together a handy comparison of the presidential candidates’ positions on key development issues. Of the major candidates, as a rule, Hillary Clinton’s are the most detailed and John McCain’s vaguest, with the similarities between Barack Obama and Clinton outweighing the differences. Take for example regional infrastructure. For many land-locked African countries, the only access for goods to ports for export comes through other countries. If a country invests in improving its roads, but the countries lying between them and the port don’t make matching investments, little is gained. For maximum effectiveness, transport projects need to be co-ordinated between countries. To better tackle all these issues at a regional level, the report calls for regional co-ordination to be built into country strategies to achieve the MDGs. Poverty reduction plans should include plans for regional co-operation in four areas: transport, water and energy infrastructure; environment; economic policy harmonisation; and political dialogue and transparency along the model of the African Peer Review Mechanism, where African countries share submit their governance for review by neighbours. In addition, the report calls for increased funding by rich countries for regional organisations. Africa has a range of these, including the Economic Community of West African States (ECOWAS) and the Southern African Development Community (SADC). But what about global public goods? The report focuses on two: global scientific knowledge, and the environment. While issues like desertification are regional, climate change is global. It stands to worsen the situation of poor countries through increasing droughts, floods, and tropical diseases. And yet, the primary responsibility for solving it must lie with the rich and middle-income countries that have largely created it. The report calls for rich countries to take immediate steps to stabilise and reduce carbon emmissions, and develop carbon “sinks” such as increased forest space to help stabilise the level of carbon in the atmosphere (although the report stops short of detailed proposals, which would probably fill at least another 400-page report). The report’s proposals in this section are fairly uncontroversial, but nevertheless significant. I’d like to have seen more robust proposals for regional cooperation, as African governments in particular are notoriously bad at it. While increased funding for regional organisations can work when the will is there, too often it’s lacking, leaving some countries punished for others’ short-sightedness. We’ve now looked over most of the UNMP’s shopping-list of investments and changes needed to achieve the Millennium Development Goals. But this is a whopping ten-year plan. How to get started? Next time we’ll look quickly at the report’s scheme to put the world on the right path. Unless otherwise indicated, page numbers come from the Overview Report. You can also see the full 300+ page version, ten key recommendations, or the reports of the individual task forces. One of the most common arguments you hear against increasing aid to Africa can be summed up in a single slogan: “trade, not aid”. It’s by trading with other countries, the argument goes, that formerly poor countries in Asia have transformed their economies and slashed poverty. Simply supplying more aid might help keep people alive, but not give put countries on the long-term path out of poverty. Instead, the report argues, trade reforms go alongside investment and social programs, funded by aid, in helping poor countries meet the Goals. We’ve already looked at the report’s investment plans, so now let’s see its recommendations for reforming the way international trade is carried out. We’ve seen the recommendations of the UN Millennium Project, the coven of experts led by Jeffrey Sachs tasked with advising the world how to meet the Millennium Development Goals, for the investments and reforms poor countries need to make to meet the goals. But what about rich countries? How does the international system of aid and trade need to change to make the goals possible?